One of the best things about ushering out 2009 is that we’re finally over the "00" decade. I mean, what was that? It was like the decade of the losers. But now we have the decade of ... oh wait, what do we call it? The tens? The teens? It’s like the prepubescent decade. Anywho, I thought I would take a moment to look back at the food trends of this past decade and give a little prediction of my own on what I think will be happening in the next 10 years. So as you can see from my list of what I think are on the way out, there are some things that I actually love like roasted beet salads. I’ll still order them at restaurants, it’s just that I feel that every restaurant serves it the same way – and that’s with goat cheese. That’s like the classic presentation, and I’m getting a bit bored of it. I hope some creative chef comes out with a new way to serve beets in the new year. Some other things that I think are going out are things that I never really liked, so I’m hoping that everyone else will be so over them. Things like sous vide, which Chef Thomas Keller of the French Laundry really endorses. But I never liked the look of meat that’s been sous vide – cooked in a very slow water bath giving it a tender texture – because it always ends up looking like raw, mushy meat. I’m thinking the fried chicken craze will be out, mostly for health reasons because I just think it’d be bad for everyone to be eating fried chicken. Some of the things that I think will be hot trends in the coming year or decade are things that I’m beginning to see quite often. You might be familiar with them already, but I see marcano almonds served with cheese at almost every restaurant now. And speaking of restaurants, I think Korean restaurants will be the new Thai. One thing that I hope will be a trend is grilled burritos. Have you ever had one? I don’t think it’s very traditional, but I love anything grilled like paninis. So it just makes sense that grilled burritos will be something worth trying. In fact, the La Salsa chain sometimes serves its burritos grilled, and that creates a nice warm burrito for lunch. So what do you think will be the hot trends in the next decade? Whatever they are, I’m really looking forward to them. That’s the thing I love about food; you’re always discovering something new. 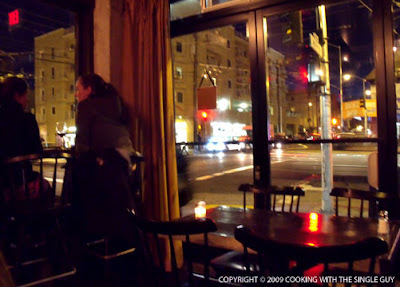 When you tell your friend to meet you at the restaurant at the corner, you want to be specific and say the one at 18th and Mission in San Francisco because it’s The Corner restaurant you don’t want to miss. The Corner can actually be easy to miss because it’s a small place in a former Chinese corner grocery spot called Wang Fat Market. The exterior is painted lacquer black (with the old embossed Wang Fat Chinese characters still visible but painted over). A few months ago they added the word Corner in gold to make it stand out more. Since it’s a small spot, it can fill up pretty quickly. 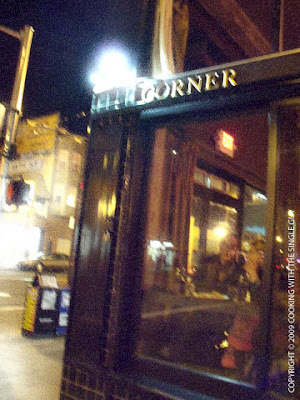 I visited The Corner one night with my friend Ken when we were thinking of checking out happy hour in the Mission. But we couldn’t come up with any interesting happy hour deals (do you know any good ones in the hood?) so we decided to just check out the Corner since I’ve never been there. The Corner is by the same people behind Weird Fish, which is right next door. 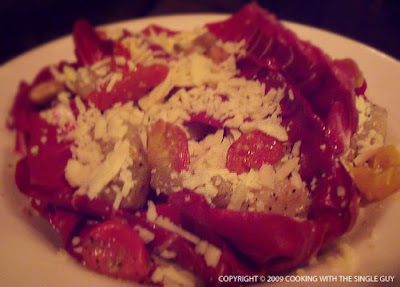 But The Corner is more like an Italian wine bar although it’s not heavily Italian but more Californian in the cuisine. Still, there definitely is wine to drink and they actually had a happy hour deal of $1 off any wine by the glass. Ken and I both ordered a glass of Barbera to start, and it was so good we ended up drinking three glasses each that night (and now I’m thinking we probably should have ordered a bottle instead but we got carried away by the happy hour deal). For the food, there are a lot of cheese and charcuterie plates to choose from, along with an assortment of small plates and a few entrée dishes. I noticed it also had a lot of vegetable-heavy dishes, which was great for Ken since he’s mostly vegetarian (I say mostly because he also eats fish). We just ordered a couple of small dishes each since we were in the happy hour mood. 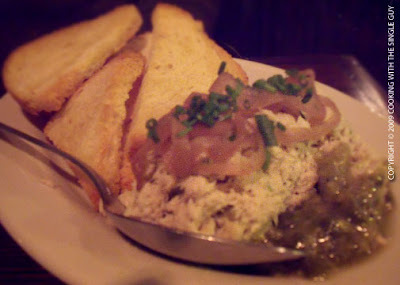 Ken started with the Slow-cooked Tuna with aioli and anchovy relish ($5.50), which he enjoyed. He offered me a bite but I have to admit that I always think of canned tuna when I eat cooked tuna, which is why I always order it slightly seared or raw. I had the Roasted Cauliflower ($4.50), but I made the wrong assumption that it was going to be a big roasted cauliflower. 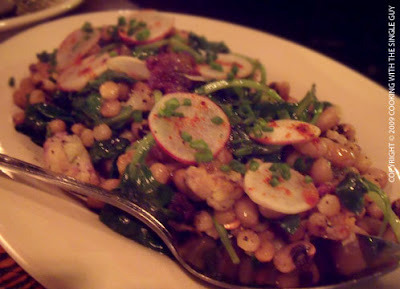 I should have continued reading because it was really a big salad filled with black-eyed peas, fregola, a few radish slices and marjoram vinaigrette. There were only a few roasted cauliflower florets, so it really shouldn’t get top billing. Still, it was a refreshing and hearty salad, with a nice large portion for a starter. Next up for Ken was a Treviso salad ($7.50). Treviso is the fancy Italian radicchio that leans on the burgundy color in the leaves. The salad came with roasted tomatoes, roasted Kohlrabi, farmhouse cheddar, cashews in a sherry vinaigrette. Again, it was a very hearty portion and great for vegetarians like Ken. I had the Veal Sweetbreads Stroganoff ($9.50), which made me think my new rule in dinner should be always order the sweetbreads (like how I always say I should order duck if I see it on the menu). I’ve never had a really bad sweetbread dish and this was among the best. The sweetbreads (the glands of the animal) were pan fried with crispy edges. It was served with a bit of cencioni pasta and king oyster mushrooms and mizuna (a kind of Japanese green like arugula). 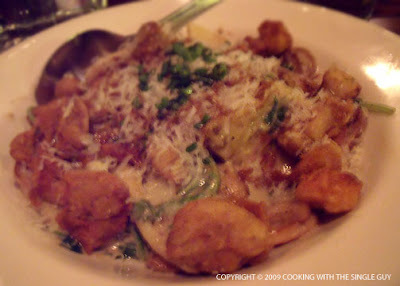 What I loved about the combination of flavors from the sweetbreads and the pasta was the slight vinegary taste that cut into the richness of the sweetbreads. Even though we just ate two plates each (and three glasses of wine), we both felt very satisfied from our starter meal at The Corner. And the place is so aptly named because the full plate window walls at the corner of the restaurant with counter seating gives you a clear view of the intersection of 18th and Mission Streets and all the comings and goings of the people, which in the Mission is always interesting. 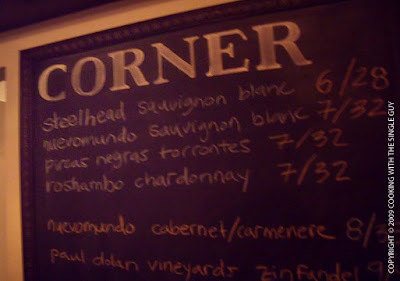 The Corner is a fun, tiny spot with entertaining food that’s affordable and tasty. 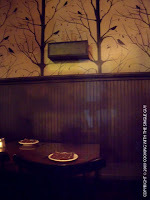 It really lives up to its wine bar image, even though the owners resist being labeled that way. Whatever they want to be, The Corner is staking out its spot in this gastronomic hotspot of San Francisco. To get a feel of how frozen yogurt has reached the saturation point, all you have to do is visit Shattuck Avenue in downtown Berkeley, where there are three fro-yo shops within a three-block radius. 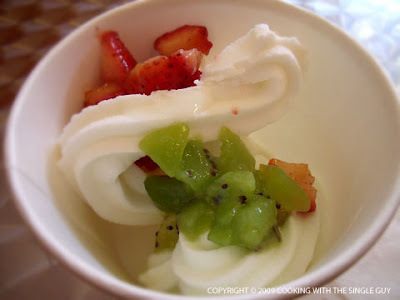 I visited one of the new frozen yogurt shops recently when I stepped into Creations on the edge of downtown. 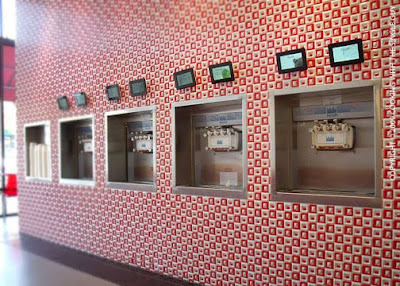 Creations is one of those self-serve yogurt spots with a nice variety of flavors. 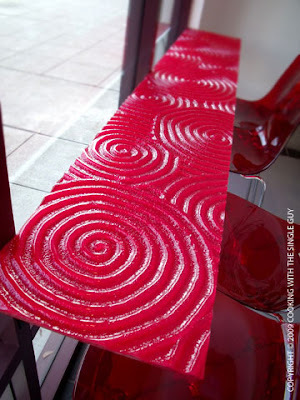 This store is definitely new and well kept, with a red-colored theme and a front table counter that reminded me of Red Vine licorice whips. The yogurt costs 36 cents an ounce and comes in the following flavors: plain, taro, blueberry, lychee, vanilla, cookies and cream, green apple, chocolate and cheesecake. I tried the lychee and green apple, and topped them with fresh kiwi and strawberries. I really liked the lychee flavor. It was slightly sweet and really tasted like lychee but not over the top. I wasn’t as crazy for the green apple, which was expectedly tart but nothing really special. I felt the consistency of Creations’ fro-yo was a bit light, almost like it leaned towards the watery side. Sure, I realize frozen yogurt isn’t supposed to be like ice cream, but I had some yogurt that had a nice milky, creamy texture. And this wasn’t like that at all. It didn’t have the annoying icy texture that I hate, but it wasn’t silky and creamy. 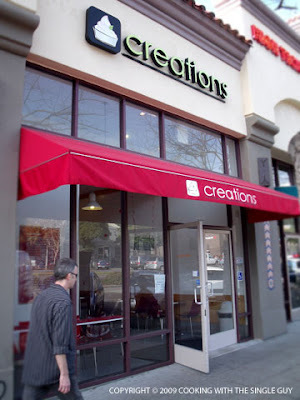 There’s still one more fro-yo spot that I have to try in downtown Berkeley (Yogurtland), but I already feel like Creations probably isn’t the best among the three. In fact, I think the senior frozen yogurt spot, Yogurt Harmony, is probably the best so far. I know I should be eating more frozen yogurt now that my cholesterol is so high, but when I see so many frozen yogurt spots, I just feel like I don’t want to see any fro-yo anytime soon. So I guess I have to stop hanging around downtown Berkeley and find my frozen yogurt somewhere else. Creations, 2370 Shattuck Ave. (at Durant), Berkeley. PH: 510.841.0280. Opened daily, noon to 11 p.m. (till midnight on weekends). 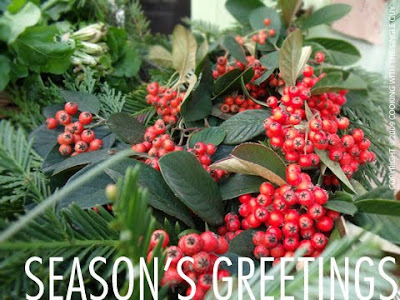 On this chilly Christmas morning in the Bay Area, I wanted to send out a message of peace, love and flavor to you all! Hope you're enjoying this holiday season. Happy eatings! Dinner, Fri.–Sat., 5:30–10:30 p.m., Sun., 5–10 p.m., Mon., Wed., Thu., 5:30–10 p.m.; weekend brunch, 10 a.m.–2 p.m.
As everyone’s gathering for the holidays, there’s no better stage than the warm, expansive Camino restaurant on the edge of Oakland’s Grand Lake neighborhood. Opened for more than a year, the natural wood-furnished restaurant with two long communal tables and fiery wood-ovens in the back looks like the perfect space for friends and family to feel at home when gathering for a simple California meal. Unless you’re The Single Guy. 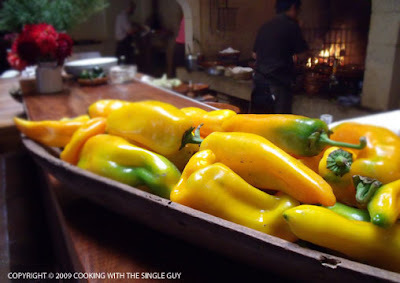 During a recent visit, I found it’s tough being a solo diner in this huge space, surrounded by large parties enjoying the seasonal, rustic fare of Chef Russell Moore, who is among the California chefs tracing their lineage to Chez Panisse and Alice Waters. When I arrived last Friday early for dinner (that’s my trick to sneak in at a restaurant before it gets busy), Camino was maybe 20 percent full when I asked for a table for one. I, of course, was offered the bar area, which I declined because it was totally dark and had only small café tables (not the best place to read my book or to order more than a small plate and drink). After waiting a few minutes for the hostess to adjust her reservations to accommodate me, I was taken to the center of one of the two large communal tables made of reclaimed redwood trees that flank both ends of the restaurant. That’s where I ended up sitting for more than five minutes alone, not being acknowledged or greeted by anyone. In the meantime, a large group of diners were seated to my left and they were promptly brought water bottles and had their drink orders taken. 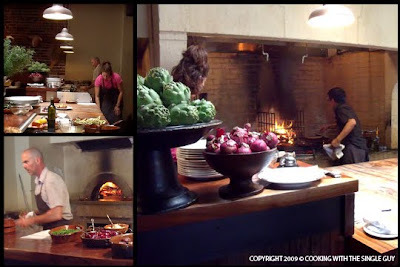 All of the restaurant’s food is cooked in the wood-fired oven or open-flame grills in the back, which actually provides a nice theater as you watch your meal come together. 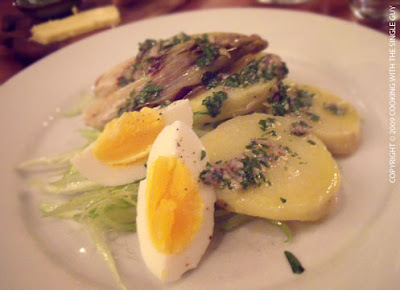 I started with the Belgian Endive Salad with Egg ($10). The endive was grilled until it was tender, letting you enjoy the meatiness of its core. It was surrounded by puntarelle, which I’d never had before but they’re a kind of chicory. They were thin and pretty on the dish, which also had three meaty slices of new potatoes. The overall plate had a simple but elegant taste that I enjoyed because of the nice balance of lemon, oil and salt used to dress everything. The salad also came with a perfectly cooked egg, and it really represented all that’s good about Camino—clean, fresh, natural, balanced, quality. For my main course, I ordered the Grilled Swordfish with Artichokes ($25). Now, I had heard early when Camino opened that the dishes weren’t very big so I was worried that I should have ordered another starter. But my worries went away when my fish arrived. The plate was filled with lots of cooked artichokes with a nice size filet topped with steaming broccoli romanesco. 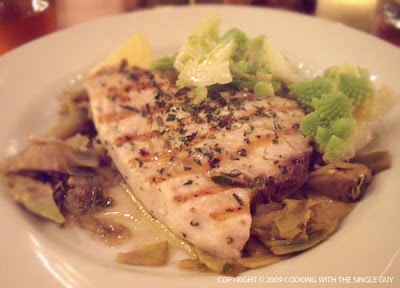 As I ate the swordfish—simply seasoned with salt, pepper and capers—I thought about how this is typically what I eat at home: grilled fish with vegetables, often broccoli. While Camino celebrates the simple preparations, it makes me think that maybe it’s not the best value meal around town. When I decide to spend $20-plus for an entrée, I expect to be dazzled and not get something I could easily make at home. Sure, everything was fresh and of high quality, but it didn’t seem as complex in flavors as my starter. Maybe because the ingredients were all known factors to me. Maybe because there weren’t any added sauce or relish to accentuate the dish. Whatever the reason, I was getting bored of dinner. So when the dessert menu arrived with choices like ginger cake. chocolate pudding and home-made ice cream, I was ready to go home and make my own dessert. Side note: Even though I was ignored at the start of my meal, I did want to say that my waiter was very courteous and efficient for the rest of my meal. 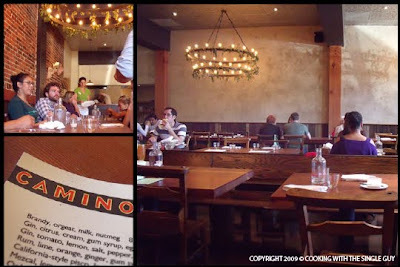 Camino also serves weekend brunch and I actually visited it earlier with my friend, Joe. I just felt my dinner was more of a defining meal experience so I started with that. 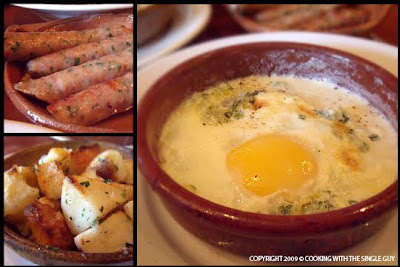 But brunch also taught me a lot about dining at Camino. For brunch, Camino offers limited choices again, so Joe and I noticed that crowds around us pretty much ordered everything on the menu to share. The menu also didn’t seem to have plates that I would classify as brunch entrées. There were no omelettes, for example. Instead, there were lots of breakfast components like sausages and eggs and one or two salads and sandwiches. 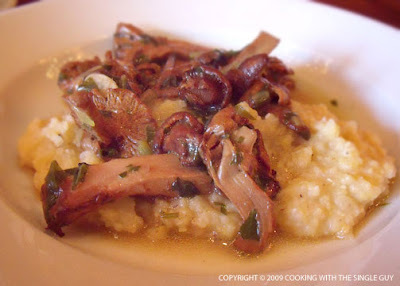 Joe ended up getting the Polenta with Grilled Chanterelles ($9), perfect for the season and looking very comforting (but not very filling IMHO). For my brunch, I pieced together a few items from the menu to create my own brunch experience. This included the Grilled Pork and Herb Sausages ($5, but now $6), Potatoes Roasted in Duck Fat ($5) and Wood oven-baked egg with herbs and cream ($3.50 for one). The potatoes are actually the naked potatoes that prompted me to write my “Ketchup Manifesto.” While they were perfectly crispy from cooking in the duck fat (cholesterol, please forgive me), Camino didn’t have any ketchup in the house for me to lather the potatoes in. In fact, I almost felt a chill when I asked for the ketchup and was told, no, they don’t serve ketchup. It was like I was breaking some kind of sustainability rule. Despite the lack of ketchup, I still ate my potatoes and enjoyed their crispy edges and tender, soft interior. The sausages were delicious, but nothing spectacular. The wood oven-baked egg (made just like how I saw Alice Waters do it on a “60 Minutes” interview in her own wood oven at home) was perfectly cooked with a soft yolk and somewhat crispy thin whites. While I really enjoy the rustic and natural space of Camino (which Michael Bauer of the Chronicle likens to a gastronomic temple), I left both brunch and dinner wondering what all the hype was about? 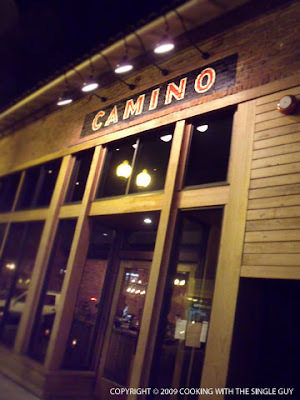 Camino has been a star even before it opened (garnering a mention in Food and Wine magazine as a place to go even though it hadn’t opened yet) and seems to attract people on a regular basis. 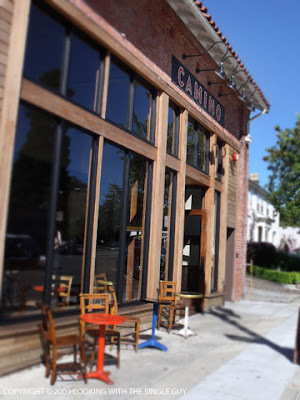 There’s no doubt that the food is fresh and seasonal, and I applaud Camino for staying true to its core beliefs of sustainable organic ingredients. But for the price, I expect more. Dining out at places like Camino should be a revelation of how simply made food can rise to a new level because of the expert techniques in the kitchen. While some dishes achieve that, others simply feel like they’ve run out of ideas. So you might remember in last week’s test kitchen, I had to buy cranberries for garnish in my Maple Sugar-Ginger Roast Pork. While it made the dish pretty and festive, I had a whole bag of cranberries in my refrigerator. 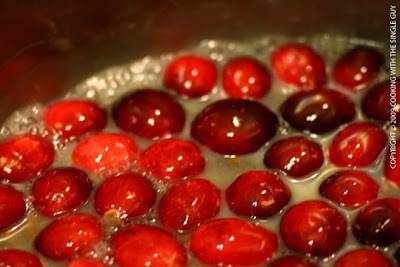 Not wanting to let the cranberries go to waste, I looked for a recipe that featured cranberries. 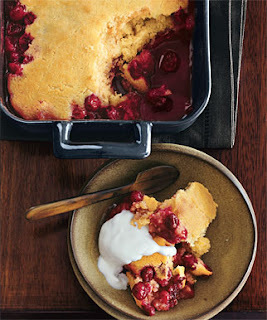 That’s when I found this Cranberry Pudding Cake recipe that I clipped out from an old Bon Appétit magazine. I remembered the photograph of the bright red cranberries against the yellow cornmeal-like pudding that really made this dish look enticing. So I thought I’d make that as a bonus test kitchen. The recipe makes 6 to 8 servings, but I wasn’t about to eat all that myself since I had to use heavy cream. (And I’ve pretty much pushed the limits on my cholesterol during this holiday season.) So I cut back the recipe and instead of making a whole baking dish of cake, I used two soufflé cups for individual servings. You can find the recipe on the epicurious.com Web site. And this is how it went in my kitchen. I started off by cooking the cranberries along with maple syrup, heavy cream, and grated orange peel. This pretty much sounds like the beginnings of a classic cranberry sauce, but it’s going to be a filler for the pudding/cake. I only had to simmer the cranberries for about a minute (I guess because it’ll cook more in the oven). 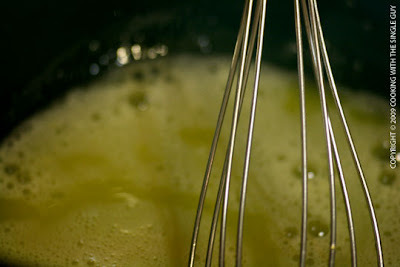 After whisking together the dry ingredients like flour and cornmeal, I whisked one large egg with the sugar. 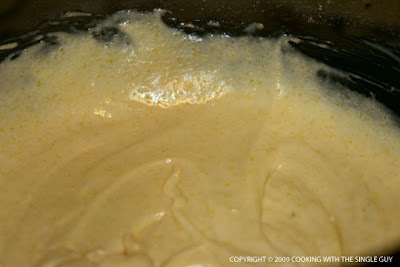 Once that was done, I slowly added the dry ingredients to the egg mixture and got something close to cake batter. 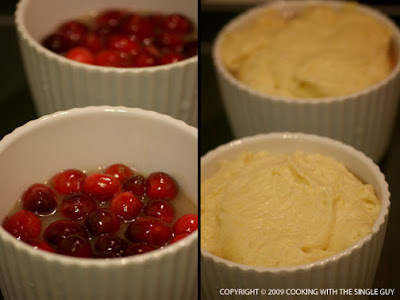 Now I assembled my cranberry pudding/soufflés by putting some of the cranberry mixture into each of the soufflé cups. Then I topped them off with the cake batter. I placed them on a baking sheet and put the whole thing in a 400° oven to cook for about 28 minutes, or until golden brown. Here it is piping hot out of the oven. It was a little bit more than golden brown but it still looked pretty appetizing. You can see that the cranberry underneath had bubbled up and made much mess along the sides. Afterwards, I thought it probably would have looked nicer for the presentation if I had dropped the cake batter in clumps so that some of the cranberry juices could bubble up in between from the center. Something to consider for the next time, I guess. 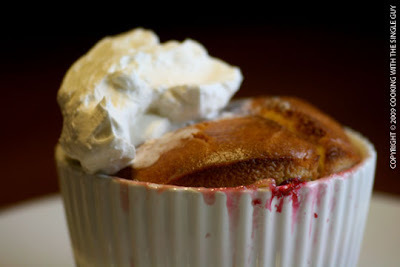 The recipe calls for topping the pudding cake with either whipping cream, crème fraîche, or vanilla ice cream. I had whipping cream in the refrigerator so that’s what I used, and you can see the warm cranberry pudding cake was melting the whipped cream as I tried to quickly take the picture. 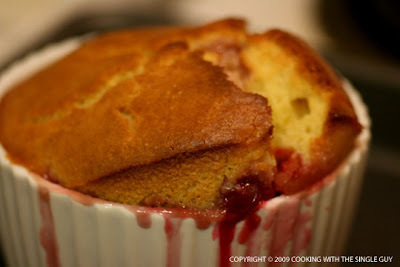 Just from looking at the cake, you can’t really tell its cranberries other than the hint of red along the edges. So here’s a picture of a spoonful of the bottom of the cake that’s supposed to be the pudding part. In the end, the cranberry pudding cake was a nice, warm dessert. Except I thought the cranberry portion tasted a bit tart. It probably would’ve been better to add some sugar when cooking the cranberries and not just rely on the maple syrup. I couldn’t even taste any maple syrup flavor. I’m not sure why they call this recipe a pudding when it really is just a cake with a gooey center. 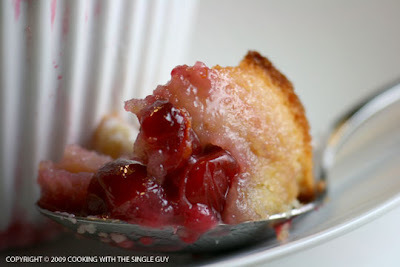 Still, it was pretty easy to make and can be a very quick dessert or sweet breakfast dish the morning after Christmas. Enjoy! Like many of you, I’m sure, it’s been a busy time for the Single Guy trying to get gifts sent off before Christmas. But now that I’m finally done shopping and cooking, I’m looking forward to a week of peace and quiet with no major plans for the holidays except getting together with friends. Still, that doesn’t mean there aren’t any food adventures to check out on the town. Yes, it’s the quiet time for lots of events because of competing holiday parties and dinners out, but here are a few events to check out if you’re interested. Dec. 21, Monday, Gingerbread House-Building Class. If you need to make a gingerbread house for your Christmas party this week, rush over to Autumn Express at 2071 Mission St. for a gingerbread-making class Monday night taught by local artist Michele Simons. Class runs from 5 to 6:30 p.m. and costs $30. Click here to register (if there are any openings left). Dec. 22, Tuesday, Outside In. This is a celebration of the street food craze, but instead of hitting the streets (especially during these cold, sometimes rainy weather), you can head inside and munch on food from Smitten Ice Cream, Evil Jerk Cart, Adobo Hobo, or Crème Brulee Cart (just to name a few) while listening to music from various DJs. The event, put together by Soul Cocina and Little Skillet, takes place from 6 p.m. to 1:30 a.m. at 330 Ritch (at Townsend). It’s free to get in (but you need to be over 18) and you pay for the food you eat. Portion of proceeds will go to St. Anthony Foundation and Casa De Las Madres. 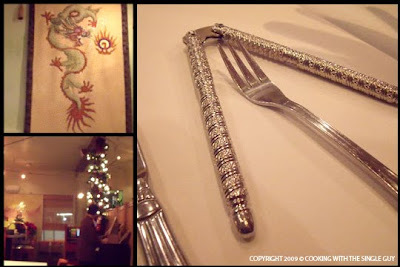 Dec. 24, Thursday, Feast of Seven Fishes at Incanto Restaurant. The Italians celebrate Christmas Eve with a dinner that includes seven different fish dishes. Well, those Italians have a lot of time to sit for a seven-course dinner. 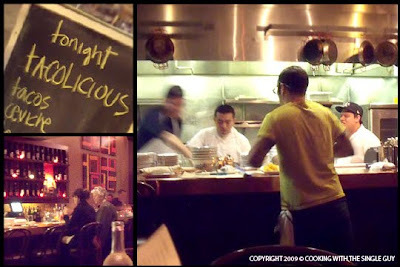 Locally, you can check out the celebration at Incanto in Noe Valley and Chef Chris Cosentino, who will offer a three-course version for $45. Call 415.641.4500 for more information. NOTE: If you’re planning to head to the Ferry Plaza farmers market on the day after Christmas for the regular Saturday market, forget it because they’ll be closed for the holidays. The stores inside the Ferry Building will be open, but not the outdoor farmers’ stands. You’ve been warned. 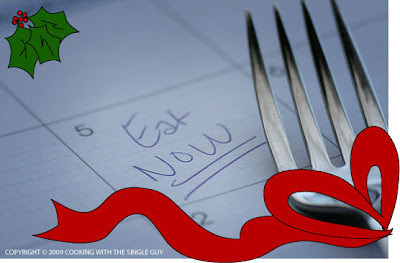 And plan ahead in the new year when Dine About Town kicks off the year from Jan. 15-31, 2010. Choose from prix-fixe lunches ($17.95) and dinners ($34.95) from a variety of restaurants. Go to the official Web site to see who’s participating and plan your reservations accordingly. Have a festive holiday season! In today’s economy, everyone’s looking for a deal. And one of the best deals I heard about in town was Laiola’s “Taco Tuesdays” when you can get a taco, tecate beer and tequila shot all for $10. While I’m not a big taco fan, I knew others who were so I organized another one of my single guy dinners recently at this Marina hot spot. 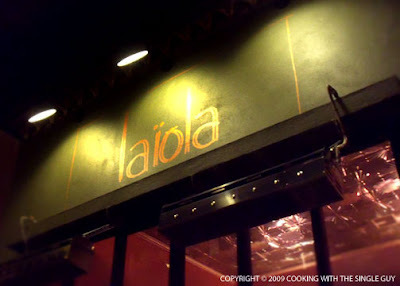 As I was planning the dinner with my friends Ken, Doug, Billy and Tom, I read news that Laiola will be closing at the end of the year and reopening in February as Tacolicious, the concept owner Joe Hargrave has been experimenting with at the Thursday farmers market at the San Francisco Ferry Building. So it turns out Taco Tuesdays will soon be every day of the week. At dinner, the menu gave a preview of what Tacolicious would be like. And that’s a lot of tacos and Mexican dishes like mole, burritos and ceviche. While I understood the shift to Mexican cuisine, especially on Taco Tuesday, I was still hoping there would be some of my favorite Spanish-influenced dishes I had when I first visited Laiola. Things like grilled squid or anything ala plancha. 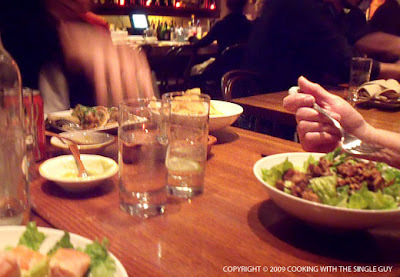 But instead, the menu seemed to be mostly sides like drunken beans, potatoes, and other vegetables. They were still mostly the small plates formula, with prices ranging from $7 to $14. 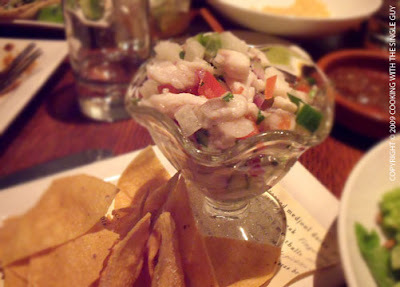 I ended up ordering the Rock Cod ceviche ($7), which came in a little cocktail cup. The fish pieces on the top seemed dry, like it was sitting for awhile or something. But once I dug down to the bottom, the rest of the dish was moist and tasty. I didn’t see anything else on the menu that I really wanted to get, so I ended up just getting the green salad topped with grilled salmon ($14). Tom got the same salad but with chicken as the topping. Both Tom and I enjoyed our salads because of the freshness and the nice, creamy dressing mixed with roasted sunflower seeds. 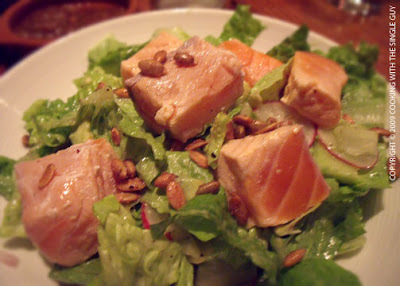 With my salmon, my salad had an extra kick of healthiness with cubes of tiny avocado. The only thing that threw me off about the salad was the large cubes of salmon. I expected a thin filet of grilled salmon, but instead they were these large cubes, which meant 80 percent of the salmon was raw so when I bit into it, it was like eating a marshmallow. An odd texture for me, that’s for sure. But if you like raw salmon, then you’d like this preparation. The rest of the gang went the Tacolicious route ordering the Mexican-themed dishes. Doug got a hefty pork dish with mole sauce that he totally enjoyed, and both Ken and Billy ordered the taco specials, which was three street tacos for $10. There were about five different tacos that they could choose from. 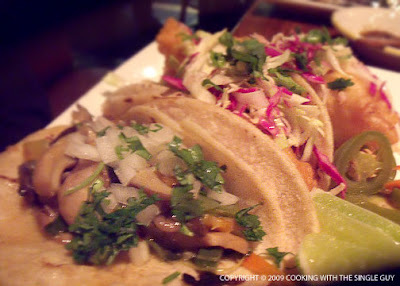 Above is a shot of Ken’s plate of tacos, which were mostly vegetarian and one made with rock cod. Side note: Even though it was Taco Tuesday, Laiola doesn’t give out free chips and salsa, even though they give you three types of dipping sauce. We had to buy our chips ($4) and I thought the chips were inconsistent. They were all thin, but some were crispy while others were stale. They need to watch their quality control since they’ll probably be serving up more chips as Tacolicious. While it was a fun evening hanging out with the guys and Laiola still had that young, fun vibe, I was missing the food that I first fell in love with. While I do eat Mexican food, I have to be honest and say it’s not one of the top cuisines that I seek out. So you can probably guess that I’m already missing Laiola and probably won’t be checking out Tacolicious in the new year. Update experience (previously 4 stars): Knocking it down to 3.25 stars because Laiola is already on it’s way out. Not that excited about Tacolicious. 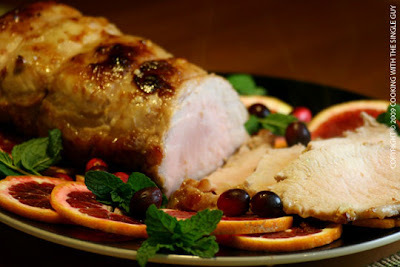 The pork definitely looked perfect for the holiday table with its garnish of red currant and mint. But did it meet the test for a satisfying meal? The recipe, from the December edition of Food and Wine magazine, comes courtesy of the popular bakery in Brooklyn called Baked. I don’t think they serve pork at the bakery, so this recipe came from the owners’ book editor, Luisa Weiss. As usual, you can go to the magazine’s Web site for the complete recipe. Here’s how it went when I tried it out recently. You have to prepare the pork the night before because it has to marinate in the refrigerator overnight. I put together the simple glaze of maple sugar, grated fresh ginger, olive oil and crushed red pepper. I actually couldn’t find maple sugar, which is just a crystallized version of maple syrup, so I went with the recommendation of the recipe and used dark brown sugar. I also made slits in the poor and slipped in slivers of garlic like the recipe said. After inserting the garlic and rubbing on the dark brown sugar glaze, I wrapped up my pork in plastic wrap and placed it in the refrigerator. The next night when I was ready to cook my pork, I brought it out of the refrigerator to let it get to room temperature for an hour then placed it in a 450° oven and roasted it for about 10 minutes, and then lowered the heat to 400°. Then I let it cook for another 35 minutes. 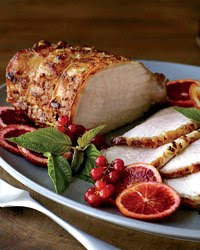 Pork loin is one of those roasts that you definitely need an instant-read thermometer. My roast actually turned out to be 140°, but the recipe said it only needed to be 135°. So the pork was more than ready. I let it rest for 15 minutes and then thinly sliced it to eat. You’re probably wondering what I did with such a large piece of pork as The Single Guy. I used one-third for a dish I made the next night with lotus root, and I placed another third in the freezer. The pork I had that night was served with braised red Swiss chard and roasted potatoes. The recipe actually tells you to buy blood oranges, red currants and mint for garnish. I think that’s actually asking a lot in a recipe to buy all that just for garnish. But to be true to the recipe, I did just that. Except I’m not sure where you find red currants so I replaced them with fresh cranberries. Here’s how my roast turned out. Do you think it looks just like the Food and Wine version pictured above? The portions for the ingredients to make the glaze actually seemed small. 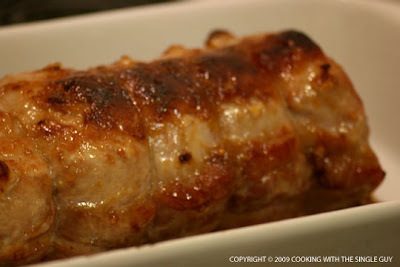 I think you can even double the ingredient portions and you’ll have a nice amount of glaze to rub over your pork loin. The picture might actually make the pork loin look dry, but that’s actually just the bright lights. The roast actually turns out pretty tender (I guess that’s why they call it pork tenderloin) but it does seem to scream out for some kind of sauce. I’d recommend something like a pear chutney or soy-ginger sauce to go with it. 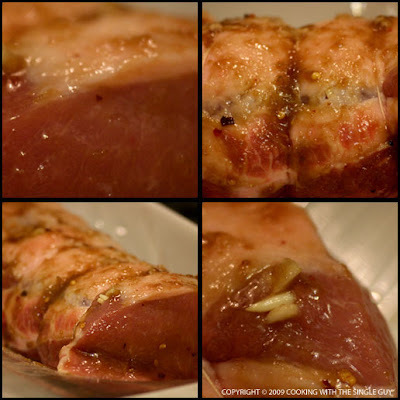 The recipe tells you to wrap your pork loin in plastic wrap after you rubbed it with the glaze. 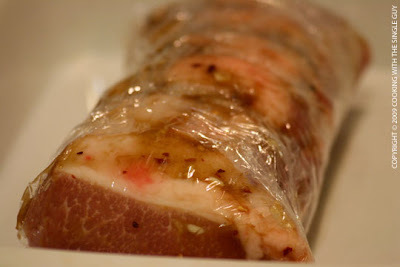 I suggest you put the plastic wrap on your roasting tray and then place the pork on the wrap before you put on the rub. Then after you rub the glaze, you can easily fold the plastic wrap around your pork to cover it. If you don’t do this step, it might get pretty messy trying to wrap your pork after you rub it with the glaze. Taste: Even though the pork was really tender, it basically had no taste at all. The overwhelming taste was pork and garlic. I didn’t get any maple sugar (or much sweetness from the dark brown sugar), ginger or heat from the crushed red pepper. That’s why I think it might have needed more glaze. Even though it was super easy to make, the taste wasn’t anything special. Overall Grade: C because it wasn’t anything special. Don’t forget to vote for which recipe I should test from Food and Wine’s January edition in the poll on the upper right column. This will be my first test in the new year so let’s make it a good one. 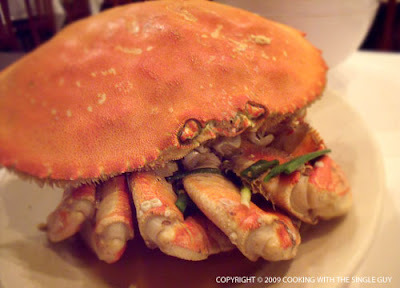 We’re right in the peak of the Bay Area’s Dungeness crab season, when this popular crustacean is plentiful and sweet. I got my first taste of this season’s crop of crabs when I went to dinner last week with my friend Margaret from Hawaii, who was in town for business. 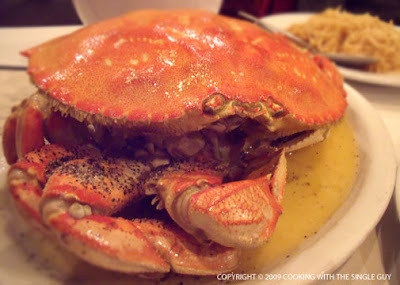 Margaret said she wanted to go for crab dinner at the popular restaurant Thanh Long, which has been open for nearly 40 years in the Outer Sunset District. I’ve never been to Thanh Long (apparently actors Danny Glover and Harrison Ford have made the trek out there) but Margaret has already been there once with her mother-in-law, Norma, who was traveling again with her. The three of us caught a cab and traveled out to what seemed the end of the Golden Gate Park area, to a quiet corner on Judah Street. When we arrived for our reservations, the place was already packed with hungry diners — 90% of whom were dining on Dungeness crabs. The Vietnamese restaurant is like a sprawling apartment with new rooms added over the years as it grew in popularity. Our waiter presented us with menus, which highlighted many traditional Vietnamese dishes like dumplings and rolls. But when the star is crab, you really don't need to look at the menu other than to decide what kind of crab to order. 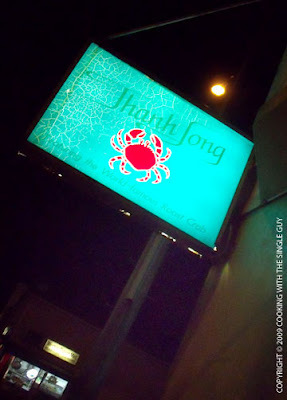 Thanh Long serves whole crab three ways: the classic roasted crab, drunken crab and tamarind crab. Since there were three of us, we decided to order two crabs. So we got the roasted crab and the drunken crab. And you can’t order crab at Thanh Long without its popular garlic noodles. To round off our dinner we got an order of stir-fried vegetables, which on this night was green beans with shitake mushrooms. It seemed like we had only ordered our dishes just five minutes ago when our waiter brought our crabs to the table. All the other dishes we ordered came with the crabs as we ate family-style. Oh, I forgot to mention that before you eat, everyone is offered a plastic bib, which the waiter will gladly tie around your neck for you. I’m not sure why people find the need to wear a bib when eating shellfish like lobster and crab. I personally think someone in the restaurant industry a long time ago thought it would be funny to dress his diners like a 1-year-old. Margaret and Norma wore their bibs proudly. I went sans bib (and did not get a speck of crab on myself, thank you very much). As we dived into the crabs, I started with the roasted crab, which was glistening from the garlic-butter sauce. The legs of the crab were spotted with black pepper, which added some spice to the sweet crab meat but was a little overbearing at times. For the drunken crab, the shell looked dull but the meat was far from it. Simmered in Chardonnay, sake and brandy, the crab had an interesting flavor that was also slightly spicy. It wasn't very alcoholic; it was just right. The garlic noodles were amazingly simple but so good. 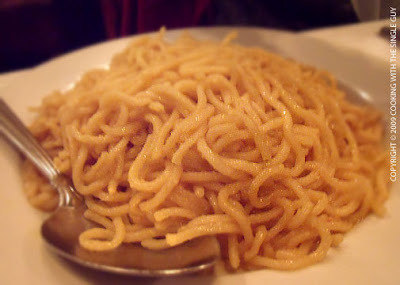 It was just like its name — egg noodles with garlic flavor. There wasn’t anything else (although you could order it with tiger prawns) but it was very enjoyable. The garlic flavor was very distinct even though I didn’t see one speck of minced garlic. My only complaint about this dish (and Margaret agreed with me) was it came to the table already cold. Margaret suspected that the noodles were made earlier in the night and just sat there waiting on the crabs. Side note: Eating crabs can be pretty messy, of course. I wished there was a dipping bowl to rinse our hands as we ate. Instead, we basically had to plow through the crabs until we were done. That's when we got warm wet towels to wipe off our butter-coated hands. The nice thing about eating crabs is that it’s not very filling. Even though we ate two whole crabs between the three of us, we still had room for dessert. 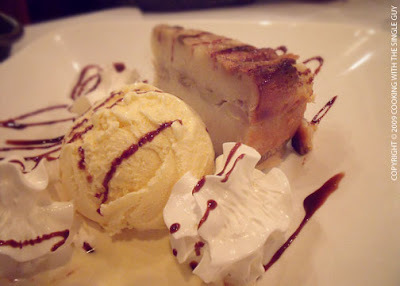 We ordered the classic banana cake, which was served with vanilla ice cream. Again, the cake would have been more enjoyable if it was served warmer. Still, it was a nice ending to our crab feast. Thanh Long is a long way to go for fresh crab. I’ve had other whole crabs at other San Francisco restaurants that were just as good. I mean, how can you go wrong with butter and fresh Dungeness crab? But with its reputation, Thanh Long is a San Francisco tradition. You have to come here at least once if you live in San Francisco.